OK, iron-on transfer pen — I have another task for you. 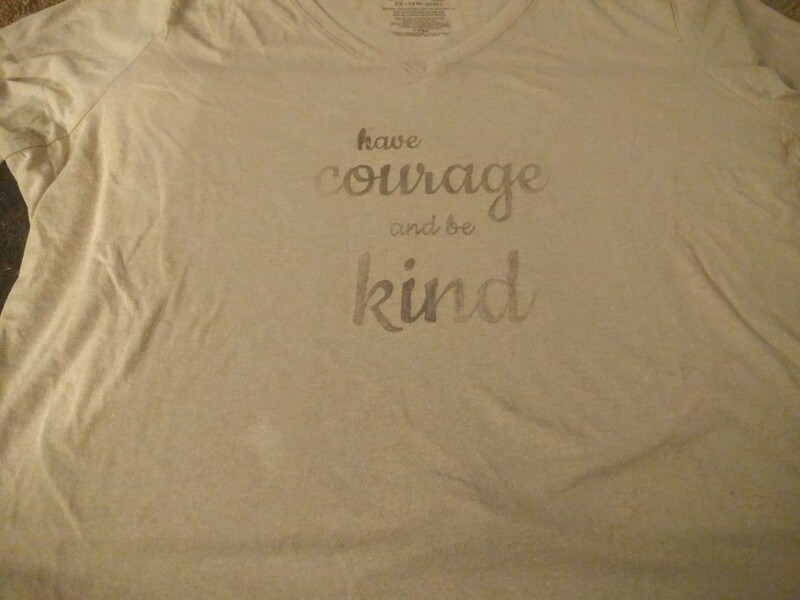 Ever since watching the live-action adaptation of Cinderella, I really wanted a shirt that said “Have courage and be kind” but not spend more than $20 for it. The freezer paper method was out because my Exact-O knife precision isn’t great and my patience is super thin. So, the project idea sat on the shelf until the iron-on transfer pen caught my attention. In a perfect world where I have amazing patience, my Cinderella shirt would be complete after using the magical transfer pen. 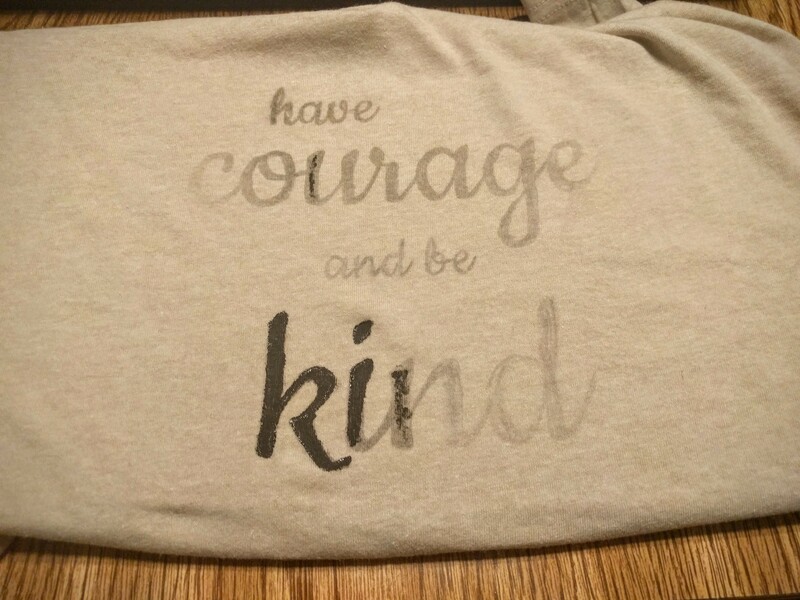 I snagged a simple light tan shirt for $3 and decided it would be the perfect canvas. 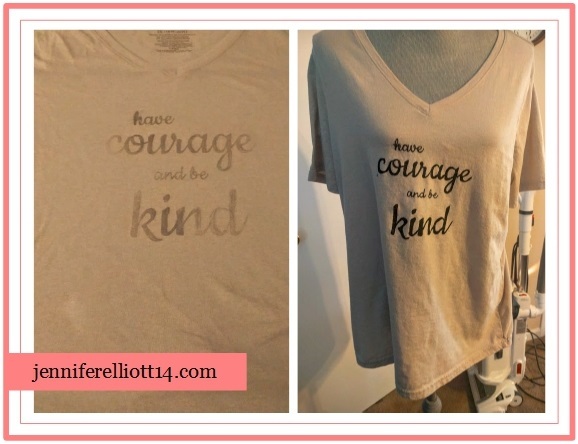 But first, I needed to play with fonts and sizes on the phrase “Have courage and be kind” on my computer. Once the phrase was perfect, I reversed or mirrored the image and printed it out on normal copy paper. I cut off the excess paper and carefully filled in the letters with the transfer pen. Next time I want another phrase on a shirt, I will outline the letters instead of solid letters. Sometimes I could see where I filled in some letters, and other times I just wasn’t sure. An outline would probably work better. Anyway, once I filled in the letters with the pen, I heated up the iron and ironed out the area where I wanted the phrase. 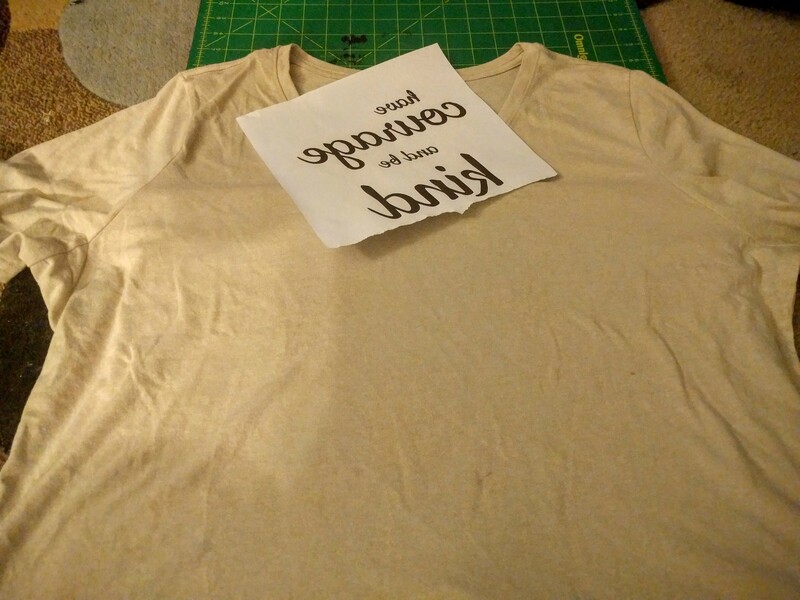 With the letters side down, I placed the paper on the shirt and eyeballed where the phrase would sit. With a few fingers to keep the paper in place, I slowly and carefully ironed over the paper a little longer than necessary. 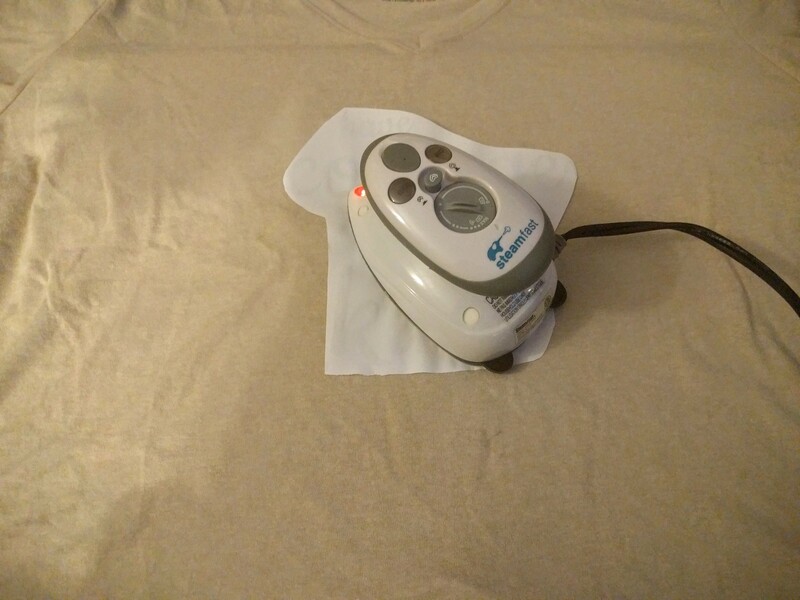 I wanted to make sure the ink transferred to shirt. Once the paper cooled off a little, I peel it back to reveal the faint phrase. Hmmmmmm. I like it but I don’t looooove it. When I look at the picture now, the shirt with the faded print had a vintage feel. Hmmmmmm. Maybe I should have left the faded print alone. Armed with black fabric paint and a paintbrush, the phrase became permanently bold. Painting took a little more time, especially with the smaller words, but I’m happy I chose to paint over the letters. In the final picture, I don’t think I centered or adjusted the shirt on the dress form so the phrase looks really crooked. In truth, the phrase is a slightly crooked, but I still love the shirt. I finally have my Cinderella shirt! Yay! Love the shirt! Very cute.